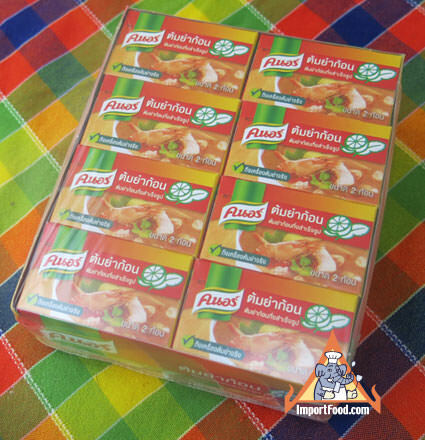 This is a very tasty bouillion cube for making the popular Thai tom yum soup made by premium quality Knorr brand. Mix two cubes with 1 liter of boilling water, add meat/vegetables (and other spice as per your preference) and boil until cooked. Tom Yum is ready to serve. You get 24 boxes, with 2 cubes per box. Each cube weighs 12 grams (approx half an ounce per cube). Total weight 576 grams. Fragrant and delicious. Add a few fresh kaffir lime leaves, Thai chile peppers and a few pieces of dried galanga -- you're on the way to becoming the best chef in town. Ingredients: iodized salt, palm oil, msg, sugar, citric acid, dehydrated bird chile, natural flavor, natural color, disodium 5. Product of Thailand.